Mylan’s roots are firmly based in the small-molecule generics business; however, the company has positioned itself as a strong competitor in the biosimilar field with the help of key strategic partnerships in recent years. Mylan has two major partnerships with Biocon and Momenta that form the majority of its biosimilars pipeline (Mylan is not developing any biosimilar candidates internally). Overall, Mylan has strategic partnerships with seven different biosimilar developers that have given the company a market-leading and comprehensive biosimilar portfolio, covering 75 percent of the top 20 selling biologics available in the current market.1 Currently, Mylan has the largest identified developmental biosimilars portfolio of any company, with 22 biosimilar candidates, of which two are approved in the United States (Ogivri — a trastuzumab biosimilar and Fulphila — a pegfilgrastim biosimilar) and one approved in Europe (Semglee — an insulin glargine biosimilar). Mylan also has five biosimilar molecules under review for EMA approval and one non-innovator biologic under review for FDA approval (see Table 2, Mylan’s Biosimilar Pipeline). At a recent investor day presentation, Mylan president Rajiv Malik highlighted the importance to the company of focusing on biosimilars. With multiple strategic alliances under Mylan’s belt, Malik emphasized that the company is positioning itself as a “partner of choice” regarding biosimilars. 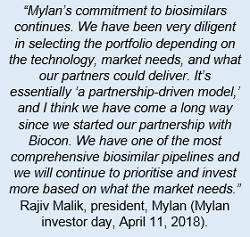 This partnership is mutually beneficial; Biocon lacks commercialization experience as well as payer/provider familiarity in developed markets, which Mylan provides, while Mylan has been able to leverage Biocon’s manufacturing knowledge and capabilities in a lower-cost market. Furthermore, Mylan’s experience in navigating regulatory systems in developed markets will also benefit Biocon. Research from Decision Resources Group suggests that the level of trust in a manufacturer is one of the key factors influencing physicians’ likelihood to prescribe and payers’ likelihood to reimburse a biosimilar,3 and that companies more familiar to physicians and payers are likely to see more uptake, meaning Mylan’s reputation should be beneficial in fueling uptake of Biocon-manufactured biosimilars in developed markets. 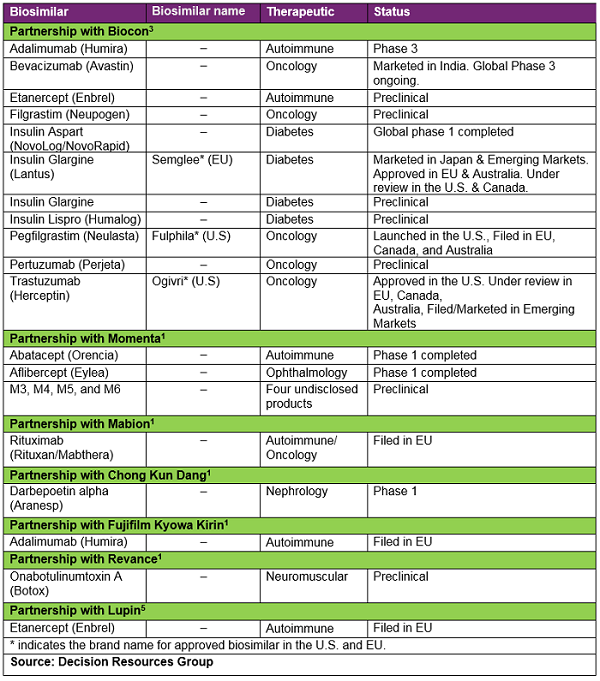 To date, Mylan and Biocon have 11 biosimilar molecules in their pipeline (see Table 2, Mylan’s Biosimilar Pipeline). Mylan/Biocon are in a strong position in the U.S. market: Fulphila is the only pegfilgrastim biosimilar currently available, and Ogivri is the only trastuzumab biosimilar currently approved in the United States (however, it can’t be launched until June 2019 due to patent protection). Mylan/Biocon also have an insulin glargine biosimilar (Semglee) approved in Europe. Furthermore, Mylan/Biocon have bevacizumab and adalimumab biosimilars in Phase 3 and an insulin aspart biosimilar molecule in Phase 1 developmental stages. The rest of the five biosimilar molecules being developed by the partnership are still in the preclinical stage, including biosimilars of filgrastim and insulin lispro — both of which already have biosimilars available in the U.S. and Europe. Mylan followed a similar strategy to broaden its biosimilar portfolio through one-drug deals with Revance for an onabotulinumtoxin A biosimilar7 and with the South Korean company Chong Kun Dang (CKD) for a darbepoetin alfa biosimilar. Malik has made this strategy clear, stating, "If we don’t have a product and the market needs it, we’ll go and find it.” He further explained, “The rituximab biosimilar deal in Europe is a good example; we didn’t have it in the portfolio for either Biocon or Momenta, but we could find an opportunity with Mabion.”1 Interestingly, there are already two rituximab biosimilars available in the European market, Celltrion/Mundipharma’s Truxima and Sandoz’s Rixathon, meaning Mylan’s biosimilar is set to be the third rituximab biosimilar to come into the European market. Although Rixathon was launched just a month after Truxima, research conducted in Germany by Decision Resources Group indicates that at approximately 12 months post launch of rituximab biosimilars, a higher percentage of physicians prescribed Truxima than Rixathon;8 therefore, it will be interesting to see what pricing and go-to-market strategies Mylan will employ in order to attempt to gain market share for its late-entry rituximab biosimilar. Mylan signed its latest collaboration with Indian company Lupin in June 2018 to commercialize its etanercept biosimilar in Europe, Australia, New Zealand, Latin America, Africa, and most markets throughout Asia.12 While there are already two etanercept biosimilars available on the European market, Sandoz’s Erelzi and Biogen’s Benepali, the etanercept biosimilar that Mylan had access to via Biocon’s pipeline is still in preclinical development, meaning it can access the market more quickly through this deal with Lupin. Lupin had already filed the product with the EMA at the time of the deal, and if approved, Mylan could launch this product in Europe by mid-2019, further broadening its presence in the biosimilars space. 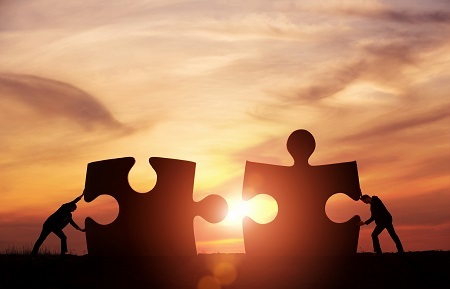 Mylan’s company partnerships to date have expanded its access to different biosimilars and given it more rapid access to key biosimilar markets. These partnerships, which have expanded Mylan’s product footprint beyond its previous portfolio, have set the company up as a leading player in the biosimilar space, and based on the pace of recent deals and sentiment from investor presentations, its momentum in this field appears set to continue. Mylan Investor day, April 2018. http://investor.mylan.com/static-files/6b4f3f3f-7247-47de-82fa-5fb140d89850. Accessed on August 14, 2018. Biocon Investor presentation, May 2018. https://www.biocon.com/docs/Biocon_IR%20PPT_May%202018.pdf. Decision Resources Group, Primary market research, Payer Insights (US/EU). https://insights.decisionresourcesgroup.com/biosimilars/access-reimbursement-origin/payer-insights-overview-us-eu5/landscape. Momenta press release. http://ir.momentapharma.com/news-releases/news-release-details/momenta-pharmaceuticals-announces-worldwide-collaboration-mylan. Accessed on August 16, 2018. Momenta press release. http://ir.momentapharma.com/news-releases/news-release-details/momenta-and-mylan-report-initial-results-phase-1-clinical-trial. Accessed on August 16, 2018. Mabion press release. https://mabion.eu/en/blog/mabion-signed-supply-and-commercialization-agreement-mylan-regarding-mabion-cd20--eu/. Accessed on August 16, 2018. Mylan press release. http://investor.mylan.com/news-releases/news-release-details/mylan-bring-biosimilar-botox-market-through-collaboration-and. Accessed on August 17, 2018. Mylan press release. http://newsroom.mylan.com/2018-04-11-Mylan-Partners-with-Fujifilm-Kyowa-Kirin-Biologics-to-Commercialize-Biosimilar-to-Humira-R-adalimumab. Accessed on August 20, 2018. Mylan press release. http://newsroom.mylan.com/2018-07-27-Mylan-and-Fujifilm-Kyowa-Kirin-Biologics-Announce-Positive-CHMP-Opinion-for-Hulio-TM-Biosimilar-Adalimumab. Accessed on August 17, 2018. Decision Resources Group, Immunology forecasts. https://insights.decisionresourcesgroup.com/biosimilars/market-events-and-forecast/immunology/overarching-forecast-assumptions. Lupin press release, June 2018. http://www.lupin.com/lupin-and-mylan-partner-to-commercialize-enbrel-etanercept-biosimilar.php. Accessed on August 14, 2018. Jimmy Jacob, Ph.D., is a driven life science analyst with in-depth knowledge and expertise of the biopharmaceutical industry. Currently he is part of the biosimilars analyst team at DRG conducting both primary and secondary market research across four therapeutic areas — oncology, endocrinology, immunology, and nephrology. His role also involves developing forecast methodologies and providing in-depth analysis and insights for the biosimilars team. Prior to joining DRG, Jacob was working as a scientist in Medimmune and Horizon Discovery, focusing primarily on gene editing technologies.